In 1970, a new church was built (primarily by members) on the corner of Riggs and Prickly Pear. For the next twenty years, it was the dream of the congregation to have a sanctuary that "looked like a church" and would glorify God. By 1990, plans were underway to construct an addition to the building to provide a sanctuary and additional classrooms. On November 3, 1991, the first service was held in the new sanctuary and the former church became our fellowship hall. In 1912, tired of interruptions of church services by trains and because of the smelter expansion, the church moved to a new site on Main Street across from the Main Street School. After our original formation there were two nationwide church group mergers, and we finally became known by our current name, the East Helena United Methodist Church, in 1967. In that same year our church on Main Street burned down. After the fire, the congregation held services in the Catholic church and the Episcopal Church. 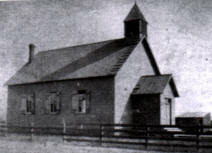 The East Helena United Methodist Church began with Brother W.W. Van Orsdel (an early Montana circuit-riding preacher) who preached a revival meeting at Prickly Pear Junction and gathered fifteen converts into a class in 1873. By 1887, Methodist Episcopal Church services were being held in the Northern Pacific Depot and eventually moved to a small frame church close to the depot.